It's very rare to see clouds like these from this perspective. From space, all clouds appear flat most of the time, but NASA's Aqua satellite got this beautiful angled shot on December 2. 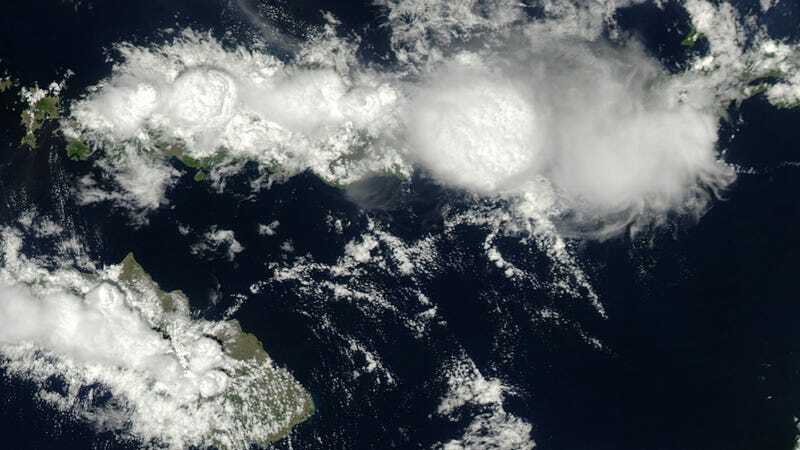 They look like ice cream clouds crowning a giant banana split over the Indonesian island of Flores. In a view from high altitude, height can be a difficult thing to gauge. The highest of clouds can appear to sit on a flat plane, as if they were at the same elevation as the ocean or land surface. In this image, however, texture, shape and shadows lend definition to mushrooming thunderheads over the Indonesian island of Flores. The Moderate Resolution Imaging Spectroradiometer (MODIS) on NASA's Aqua satellite acquired this image on the afternoon of Dec. 2, 2013.